Dragon Boat Festival (Duanwu Festival) is annual fifth lunar month , also known as Duanyang Festival Festival , May Day and so on . According to legend, is to commemorate Qu Yuan – The day he throw himself into the river. Qu Yuan is Chu people of China’s Warring States Period. He advocated that choose the virtuous , enrich the country and increase its military force , and fight Qin with other countries together (Qin is the most powerful country in Warring Period) etc. But he was against by aristocratic of Chu who were strongly opposed. Qu Yuan was greedy resigned, and expelled from the capital and exiled to the basin of Yuan, Xiang River. In 278 BC , Qin defeated Chu. Qu Yuan seeing their country was invaded , his heart is broken. But he still can not bear to abandon his homeland . On May 5 , he threw himself into Miluo River with carrying and end his life after wrote a swan song of ” Huaisha “. Qu Yuan ‘s use his life to wrote a respectable patriotism story. After that, there is a dragon boat racing , eating zongzi , drinking realgar wine etc, the ways to commemorate the patriotic poet Qu Yuan . Dragon Boat Festival is an important traditional Chinese festivals, especially in southern China . In the main city in the south of China, dragon boat racing events held every year. People compose different teams participates the competition, to enjoy the traditional activity. 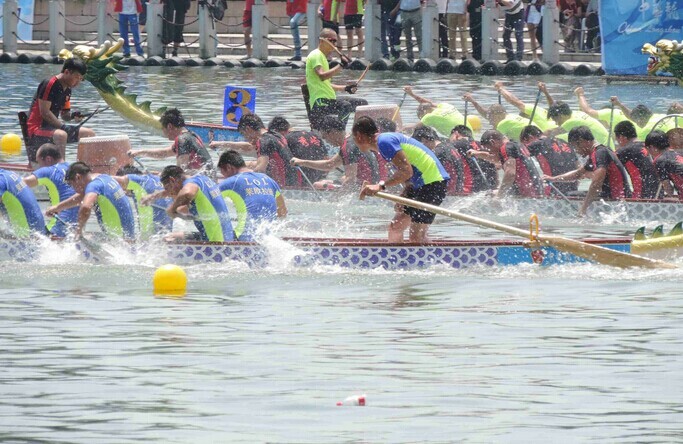 Dragon Boat Race is now not only a festival activity, it is also a loved sport by everyone. You always can hear cries from the dragon boat race from May until August. Wellgreen invite you to enjoy our festival too, wish you have a good festival and happy day. The article was wrote by Wellgreen Sanitary Valve and Fittings .